Display Fölläri (bike rental) station status information in "top" style. Supports sorting by bikes available, name and stop code. MQTT publishing support using libmosquitto. See screenshot below for example outputs. There is also an alternative version available that is written in Ada. (Why? Well, got inspired to learn Ada and I wanted to do something somewhat usefull directly. And my daughters middle name is Ada so dad must know the language... right?). It is much simpler but can work as a guide on how to handle http requests and JSON parsing using AWS and GNATCOLL libraries. Finding out how they work with the extremly limited and bad documentation out there was quite a challenge. 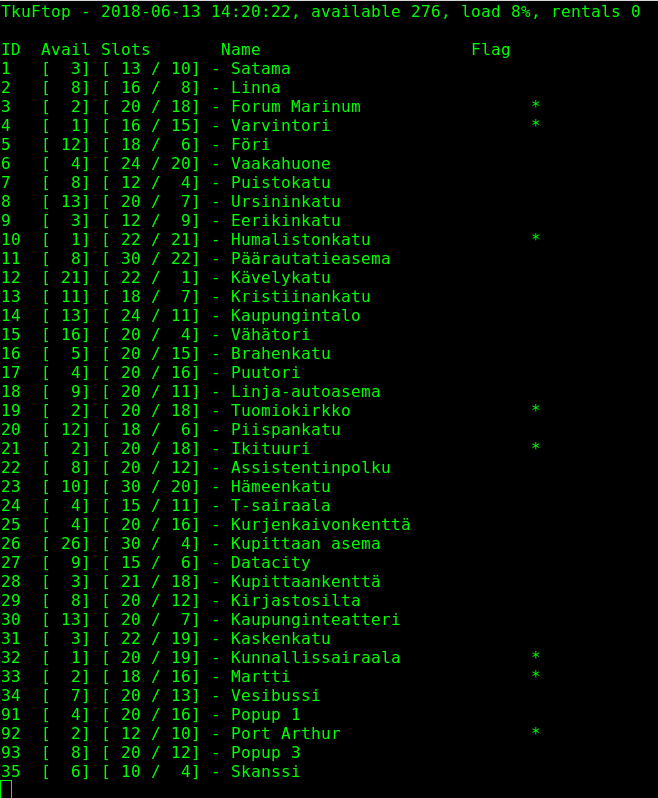 Anyway, source for Fölläri Tools Ada edition are on github. Have fun!